Fleeing to a total immersion language school in the idyllic South of France, Alyce puts love and her failed career on hold to do an extreme makeover on herself. While she struggles to learn French and attain some degree of chic, she attracts the attention of several locals, with disastrous results. Tension escalates to a new level when she's forced to stay at the guest cottage of the enigmatic author Jean-Luc. She finds herself strangely attracted to him, though he seems to despise her and they communicate mostly through bickering. Soon, Alyce must choose between what she thought she wanted and something totally different. 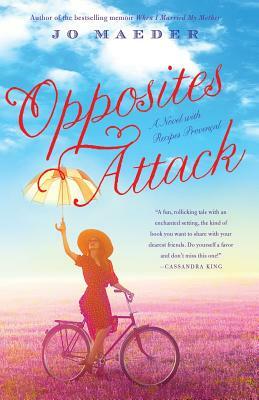 Set against the alluring background of the Mediterranean with recipes inspired by Provence, Opposites Attack is a fast-paced romantic comedy with a French twist.